For the 1974 Soviet film, see The Straw Hat. For the main character from One Piece, see Monkey D. Luffy. A straw hat is a brimmed hat that is woven out of straw or straw-like materials from different plants or synthetics. The hat is designed to protect the head from the sun and against heatstroke, but straw hats are also used in fashion as a decorative element or a uniform. Rye straw: used for the traditional bryl straw hats popular among the peasants of Belarus, southwestern Russia and Ukraine. Toquilla straw: flexible and durable fiber, which is often made into hats in Ecuador, but popularly known as Panama hats. Chip straw: from White pine, Lombardy poplar, or English willow, has historically been used, but has become less common. The mokorotlo, a local design of a straw hat, is the national symbol of the Basotho and Lesotho peoples, and of the nation of Lesotho. It is also displayed on the license plates of that country. President Theodore Roosevelt helped popularize the straw Panama hat during his visit to the Panama Canal. Roosevelt used his natural ability to drum up publicity by posing for a series of photos at the Panama Canal construction site in 1906. Photos of his visit showed a strong, rugged leader dressed crisply in light-colored suits and stylish straw fedoras. Boater hat — a formal straw hat with a flat top and brim. 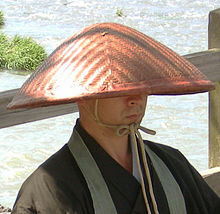 Conical hat — the distinctive hat worn primarily by farmers in Southeast Asia. Panama hat — a fine and expensive hat made in Ecuador. Artwork produced during the Middle Ages shows, among the more fashionably dressed, possibly the most spectacular straw hats ever seen on men in the West, notably those worn in the Arnolfini Portrait of 1434 by Jan van Eyck (tall, stained black) and by Saint George in a painting by Pisanello of around the same date (left). In the middle of the 18th century, it was fashionable for rich ladies to dress as country girls with a low crowned and wide brimmed straw hat to complete the look. Fillette au chapeau de paille, by Berthe Morisot (1892). Wikimedia Commons has media related to Straw hats. ^ "The Hat Story". British Hat Guild. 2003. Archived from the original on 10 May 2012. Retrieved 2016-03-14.